Dianne Feinstein: living proof that crime pays in the US Senate. For years in public view, the US Senator from California has been shoveling millions of dollars directly from the pocketbooks of US taxpayers... directly into the pockets of her investment banker husband, who profits directly from government contracts. Many of these contracts are military and war-related, and passed by the Senate (a clear conflict of interest). Usually her hypocrisy stays under the radar, but it surfaced recently when, upon realizing she was under drone surveillance, she spoke out against drone surveillance. Of course, she is a strong proponent of forced citizen disarmament despite reserving the right to carry a concealed weapon for herself. Feinstein's voting record is essentially identical to that of a neo-conservative (i.e. war-mongering fascist) Republican. Her party affiliation is not ideological but practical (she is, after all, from California). 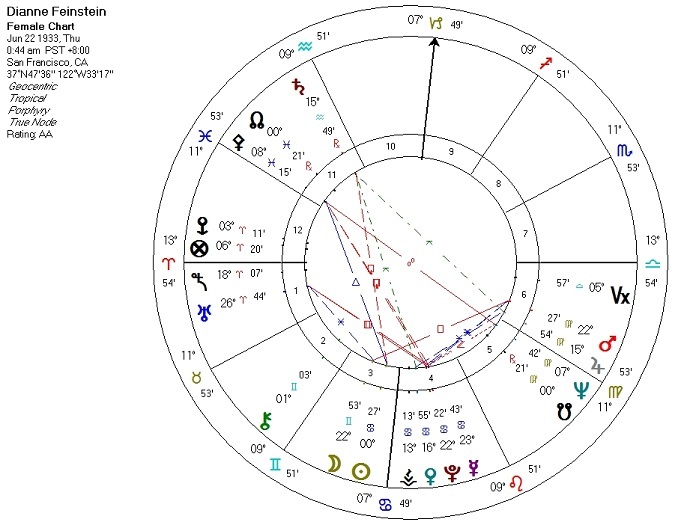 Her astrological chart accordingly resembles that of a neoconservative and not an ideological Left-liberal. Positive/Libertarian: Pallas sesquiquadrate Mercury and widely conjunct the North Node and trine the Sun. Co-ruled by Jupiter which is quindecile North Node. Negative/Authoritarian: Pallas opposite Jupiter, sesquiquadrate Pluto, and co-ruled by Neptune which is conjunct the South Node. The negatives win, even with the North Node conjunction (which is wide and does not compete with the negative-factor trifecta). Gun-control nuts tend to have negative Pallas placements in combination with Pallas-Saturn configurations. Feinstein's own Pallas placement is accompanied by Saturn quincunx Jupiter (co-ruler of Pallas). Capitalist: Venus (ruling the Second House) sesquiquadrate the North Node. A mixed signature, which usually puts the native on the Right economically. Conservative: Moon trine North Node. Liberal: Neptune semisquare Mercury, ruler of the Moon. Again, a mixed signature. Inconclusive by itself, but with the Venus placement suggests a Rightward lean. Bloodbath Formula (Feinstein is, after all, a war profiteer). 3. Pluto in Cancer in the Fourth House. Like I said: a neoconservative dressed as a Left-Liberal. And proof that the US political system does not work in the interests of those it claims to represent.